(Photo: REUTERS / Philimon Bulawayo)The last election. 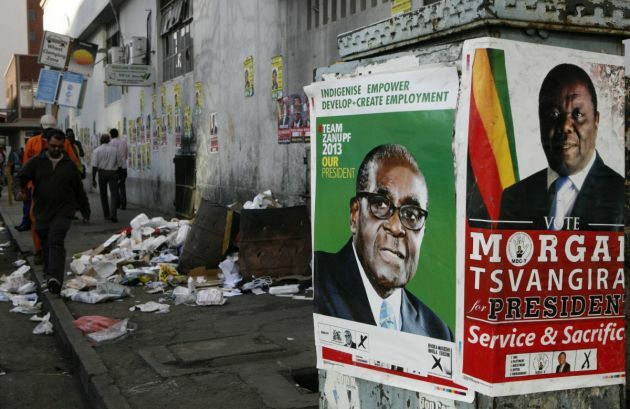 Election campaign posters are pictured near Zimbabweans walking on a street blocked by uncollected garbage in Harare July 17, 2013. President Robert Mugabe's rivals said on Wednesday the chaotic organisation of early voting for soldiers and police showed Zimbabwe was not ready for a July 31 general election in which more than six million people are registered to vote. Mugabe's main rival, Prime Minister Morgan Tsvangirai, told a rally that the long queues seen during two days of special voting for 70,000 police officers and soldiers clearly showed the Zimbabwe Electoral Commission (ZEC) was ill-prepared. Zimbabweans will go to the polls on July 30, but this vote will be different from any since 1980, Robert Mugabe will not be on the ballot. The military-backed system that kept him in power for 37 years pushed him out of power, but it is still in control, with the installation of one of Mugabe's close lieutenants for many years, The Associated Press wrote in the Washington Post of July 4. "That is the conundrum facing a southern African country anxious to shed its image as an international pariah, and to draw the foreign aid and investment needed for an economic revival," wrote Christopher Torchia for AP. He noted the government promises a free and fair election and the military, whose 2017 takeover led to Mugabe's resignation, after decades of iron-fisted rule, says it will stay in their barracks. Although some Zimbabweans, wonder how much things have really changed the churches which have often played a pivotal role in the life of Zimbabwe are encouraging a process that allows the will be the people to be heard. President Emmerson Mnangagwa, a former vice president and Mugabe ally who rewarded the military's support with key Cabinet positions for former generals is the establishment's leader. His biggest challenge is coming from Nelson Chamisa, the new leader of the Movement for Democratic Change opposition party (MDC). Its members were brutalized by Mugabe's ruling ZANU-PF party supporters during violent, fraud-tainted elections in 2008 and in earlier polls. The Vatican Ambassador to Zimbabwe, Archbishop Marek Zalewski, yesterday described the period leading to the July 30 harmonised elections as peaceful and conducive for a free, fair and credible elections, allafrica.com reported. "There is still optimism now before an election," he said. "We are approaching very important moment not only in the political life, but social life for all Zimbabweans," said Zaleweki. "This is the reason why we have to use this opportunity to express our vote, our desire." Tveit encouraged people with the challenge that, to be followers of Christ means not to live for ourselves, but to be agents of justice and peace and to share Christ's ministry of reconciliation. He reflected that God is opening a new door for peace in Zimbabwe. "I am very encouraged by what the churches are doing to prepare people for a free, fair and democratic election in Zimbabwe. This is a moment of hope and you in the churches are at the forefront of the process," said Tveit. He also called for unity, whatever the results of the election. "Your involvement in the fairness of the election process reflects your love of the people you serve in their daily struggles - the love of Christ which compels us to move." Tveit pledged that the WCC would continue to accompany Zimbabwe in the election process, "because we need this moment of hope in the world." In response, Rev. Kennedy Gondongwe, principal of the United Theological College, thanked Tveit for "making us believe in ourselves." He recalled that in 1972 the WCC had helped play a central role in the country's liberation "and again the WCC is with us at this moment of a new beginning". He noted that the church and the ordinary people in the streets want change. Rev. 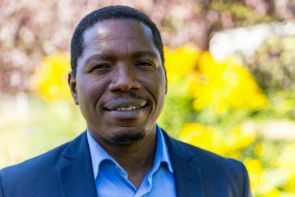 Kenneth Mtata, general secretary of the Zimbabwe Council of Churches, is leading the process of election observation, as well as several other related initiatives after the ZCC had been seen for a number of years as acquiescent to the Mugabe regime. (Photo: LWF / Stéphane Gallay)Rev. Kenneth Mtata. "The Zimbabwe Council of Churches has been a running a broad campaign, 'I-Pray-I-Vote,' aimed at mobilizing the nation to pray for a peaceful election as well as going on Election Day to vote," said Mtata. "This has been strengthened by various dialogue platforms (ecumenical election covenants) to enable the citizens to share their aspirations of the upcoming elections. Our focus is an actively engaged citizenry throughout the process." On July 2, Tveit, Mtata, and ZCC president Bishop Lazarus Mpande Khanye met with leaders of the ruling party and the opposition party. They also had a meeting with the ambassador for the European Union to Zimbabwe, Philippe Van Damme, the Zanu-PF secretary of Administration who is also the minister of Home Affairs, Dr Obert Mpofu and the MDC Alliance president, Chamisa. All of them emphasized and welcomed the role of ecumenical observers to the election, from Zimbabwe and other countries. Stephen Chan, professor of World Politics at the School of Oriental and African Studies at the University of London wrote in the The Conversation that Mnangagwa has made a virtue of not being Mugabe, promising a new start. He has made the claim that only he has the authoritative standing to persuade the West to reinvest in his country's battered economy. The West, however, has made it clear that the key precondition for any major reinvestment would be a clean election..
Chan wrote that this will probably be the cleanest election for many years in Zimbabwe. "Chamisa and his MDC Alliance have gone largely unmolested, and Chamisa has held rallies in what were once no-go regions for the opposition. The MDC platform has been covered on State television, and a real effort has been made to give public indications of a fair campaign. "But questions still linger over the integrity of the electoral roll, the printing and vetting of the ballot papers, and how any biometric element of the election would work. "And there are still plenty of senior military figures in Mnangagwa's cabinet and inner circle" said Chan. He noted that there is a huge field of presidential candidates apart from Mnangagwa and Chamisa, indicating that Zimbabwe is liberalizing. But apart from the president and the MDC leaders, none of who seems to have laid out any clear plans for the future of Zimbabwe, none of the other candidates has secured much support. "The question is whether the election will continue that process (of liberalization), or whether a last-minute panic on the part of ZANU-PF will send it into reverse," said Chan.